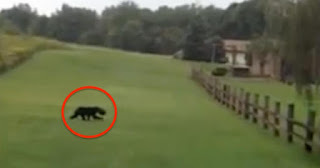 Dean Hornberger and Samantha Eigenbrod were taking a walk near their home in Clarion County, Pennsylvania, when suddenly they spotted something that really caught their attention: a black bear! Black bears are no grizzlies but you still don’t want to stumble across their path. Noticing something strange, they stopped. Then they turned around and… went toward the bear! Why? A closer look revealed that the poor animal's head was trapped in a bucket of water. It turned out, he'd been stuck for eight weeks already. He must have been simply desperate. Dean tried to free him but the bucket was jammed on so tightly that he didn't manage. A group of people gathered to help, including one person pinning the bear to the very muddy ground. For sure, none of them had ever imagined they'd have such a close encounter with a bear. Thank goodness they all took the time — and risk — to help the poor creature. It sure wasn't easy. Dean and Samantha were perhaps better prepared than most, since they happen to run an animal shelter called Happily Ever After Rescue. Their animals are certainly in good hands — what a brave, humane pair!